Pedro Fernandez is a guitarist and composer. In 2018 he released a Flamenco Chill album of original music, Sueños de Amor, which has been well received and at present has an impressive 20,000 plus streams on Spotify. He performs his music in various venues in the Kitchener-Waterloo area including fund raisers, art galleries, fine restaurants, charity and special events, weddings and concerts at the Kitchener Public Library. Pedro performs with his brother, Paul, in the much sought after Fernandez Brothers guitar duo, specializing in the art of dinner music. He is also presently hard at work on his second Flamenco Chill album which will be released in 2019. Pedro has performed hundreds of shows all over North America with various bands including a popular tribute show to Garth Brooks. magic at your next event! 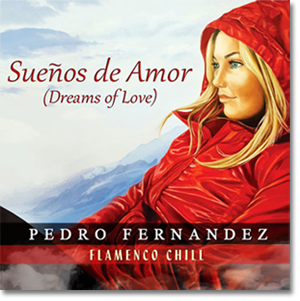 Sueños de Amor (Dreams of Love) is Pedro’s first album of original Flamenco Chill music. Drawing on his life-long love of Flamenco guitar and his appreciation for meditative-style chill music, Pedro has created this ambient, uplifting music that blends the melodic touches, colors and emotional fire of Spanish Flamenco with soulful and romantic rhythms. Pedro Fernandez is represented by BMI and by the Society of Composers, Authors and Music Publishers of Canada.